Chromium exists in nature as complexes of two stable oxidation states – trivalent chromium(III) and hexavalent chromium(VI). Although trivalent chromium is required in trace amounts for sugar and lipid metabolism in humans and its deficiency may cause a disease called chromium deficiency; hexavalent chromium is toxic and carcinogenic. As chromium compounds were used in dyes and paints and the tanning of leather, these compounds are often found in soil and groundwater at abandoned industrial sites, now needing environmental cleanup and remediation. What do we know about the biochemical roles and mechanisms of chromium? Is chromium an essential element in the mammalian diet? Is chromium(III) effective as a nutraceutical, a therapeutic agent, and as a supplement in animal feed? What is the biochemistry behind the toxicology of chromium(III) and chromium(VI):the mechanisms of metabolism, genetic and epigenetic effects, and disruption of cell signalling? What are the current chromium(VI) policies and positions from regulatory agencies? 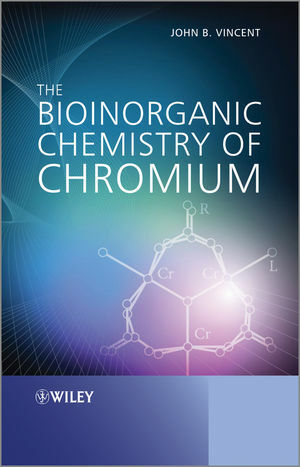 The Bioinorganic Chemistry of Chromium: From Biochemistry to Environmental Toxicology is an important contribution to the bioinorganic and trace element biochemical fields which will find a place on the bookshelves of bioinorganic chemists, biochemists, inorganic chemists, toxicologists, nutritionists and regulatory affairs professionals. Professor Vincent has been working in the area of the bioinorganic chemistry of chromium(III) for nearly 20 years.? He has ~125 peer-reviewed publications, book chapters, review articles, and books and 9 patents. He has recently completed a general chemistry laboratory manual for Pearson/Prentice Hall; the second edition of this manual will appear in early 2010. He has presented his research on chromium at numerous regional, national, and international meetings. Professor Stearns is a metal toxicologist and has been working in the field of inorganic biochemistry and metal toxicology for over 20 years. She has been teaching graduate courses in toxicology, biochemistry, and cancer biology for over 12 years. She has published 23 peer-reviewed research articles and 8 invited reviews and book chapters on metals. She has presented results of metal toxicology research at numerous scientific conferences and invited seminars.